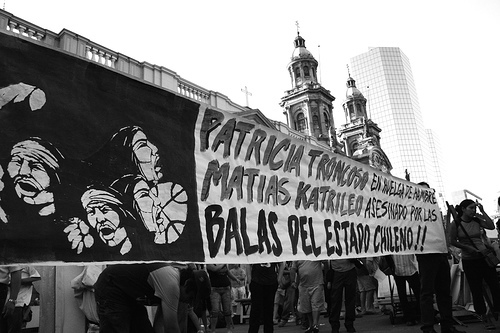 On July 12, 2010, fourteen Mapuche indigenous detainees being held at jails in Concepción, Angol, Temuco and Valdivia, began a hunger strike to denounce the Chilean State’s treatment of Mapuche communities in southern Chile. The strike is aimed mainly at ending the use of Chile’s Anti-terrorism Law against Mapuche prisoners. Con esta medida extrema y justa, extendemos la resistencia llevada a cabo por los presos políticos Mapuche en los distintos penales chilenos, que busca denunciar las injusticias cometidas en contra de nuestro pueblo, las que se ven reflejadas en violentos allanamientos, donde sus víctimas son principalmente ancianos y niños; la utilización indiscriminada y arreglada de testigos protegidos incluyendo menores de edad; el excesivo tiempo de las investigaciones encabezadas por el Ministerio Público que sólo perpetúan la prisión preventiva y en definitiva, rechazar los montajes político-judiciales, sustentados por la aplicación de la Ley antiterrorista, que buscan encarcelar a luchadores sociales Mapuche que hacen frente a la guerra de exterminio que nos declaró el Estado chileno. With this extreme and fair measure, we extend the resistance carried out by Mapuche political prisoners in different Chilean jails, which seeks to denounce the injustices committed against our people. [These injustices] are reflected in the violent raids, where the victims are mainly elders and children; in the indiscriminate and set-up use of protected witnesses [that] include underage children; [in] the excessive duration of the investigations carried out by the District Attorney’s Office [,] which only perpetuate preemptive custody[. Finally, we seek to] reject the politico-judicial set-ups, sustained by the application of the Anti-terrorism Law, which seek to jail Mapuche social fighters that confront the extermination war declared against us by the Chilean State. Photo by Patricio Valenzuela, used under a Creative Commons BY-NC-SA license. a) Devolución inmediata del Territorio ancestral Mapuche. 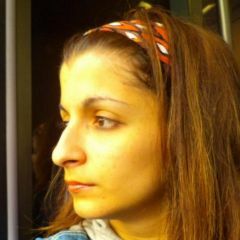 b) Fin a la aplicación de la Ley Antiterrorista, a las justas demandas y movilizaciones sociales del Pueblo Nación Mapuche. c) NO más montajes Políticos Judicial, bajo la utilización de Testigos Protegidos o sin Rostro. d) Nulidad al juicio de Lorenzo Alex Curipan Levipan, comunidad Mapuche Rankilko. e) Desmilitarización de las Comunidades Mapuche. f) Basta de Persecución Política Judicial del Estado Chileno al Pueblo Nación Mapuche, no mas asesinatos. g) NO más doble procesamientos de la Justicia Civil y Militar. h) Libertad a todos los Prisioneros Políticos Mapuche. i) La inhabilitación del fiscal anti-mapuche miguel Ángel Velazquez por su actitud inconstitucional, en los procesos judiciales, mafioso, torturador y racista. a) Immediate return of Mapuche ancestral lands. b) End of the application of the Anti-terrorism Law against the just demands and public demonstrations of the Mapuche Nation. c) No more Politico-Judicial setups [based] on the use of protected or faceless witnesses. d) Nullify the proceedings against Lorenzo Alex Curipan Levipan [of the] Rankilko Mapuche community. e) Demilitarization of Mapuche Communities. f) Enough of the Politico-Judicial persecutions of the Chilean State against the Mapuche People[/]Nation, no more murders. g) NO more double trials in the Civil and Military judicial [systems]. h) Freedom to all Mapuche Political Prisioners. i) Barring anti-Mapuche District Attorney Miguel Ángel Velazquez for his unconstitutional attitude in judicial proceedings, mafioso, torturer and racist. The demands of all prisoners participating in the hunger strike seem to coincide. Their respective statements differ mostly in the tone and all focus on the use by the State of Chile’s Anti-terror Law. Chile’s Anti-Terror Law, a Pinochet-era decree widely used during the seventeen years of the Pinochet dictatorship, allows for the trials of civilians by military courts, as well as the presentation of “protected” witnesses whose testimonies are heard and recorded anonymously. chile no tiene por qué seguir con la ley antiterrorista. es aberrante y corresponde a 1 idea POLITICA. chile no es colombia ni EEUU. chile doesn’t have a reason to continue with the anti-terror law. it’s aberrant and belongs to 1 POLITICAL idea. chile is not colombia nor the US. 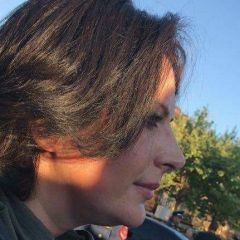 Esta legislación ha sido aplicada preferentemente y casi exclusivamente a personas vinculas a los movimientos okupas, anarquistas y a personas mapuches […E]s una paradoja que el Gobierno […] valore la liberación de los presos políticos en Cuba […] y no tenga el mismo criterio con quienes claramente pueden ser considerados como presos políticos, en el caso de los mapuches encarcelados por la ley antiterrorista. This law has been applied preferably and almost exclusively to people linked to the squatters and anarchist movement, [as well as to] Mapuche persons […] It is a paradox that the Government […] welcomes the liberation of political prisoners in Cuba […] and does not have the same criterion with those who clearly could be considered political prisoners, as is the case with the Mapuche jailed by the Anti-terrorism Law. 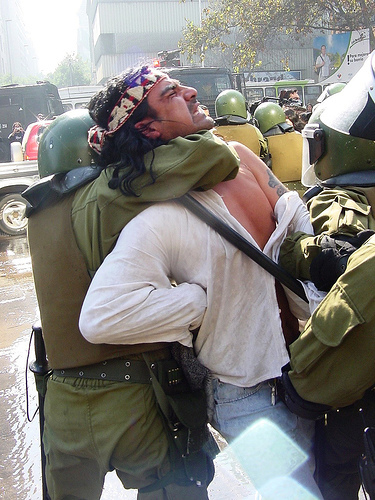 Apart from the due process problems presented by the use of the anti-terrorism law (such cases are heard in ordinary courts), Mapuche individuals accused of violence against the police are tried in military courts in proceedings that do not meet basic requirements of independence and impartiality. It is little wonder, then, that many Mapuche feel that Chile’s progressive new criminal justice system, in force since 2000 in the region most affected by the conflicts, bestows its benefits on everyone but them. Earlier, on July 19, 2010, Mapuche activists appealed to the United Nations Human Rights Council in Geneva over the law and what they see as the political persecution they face by the State. Photo by Flick user antitezo, used under a Creative Commons BY-NC-SA license. Although more than twenty Mapuche prisoners are now on hunger strike and despite the fact that they make up about a third of the total number of Mapuche persons on trial under the Anti-terrorist Law, mass media outlets have failed to give the story the importance it deserves. So far, only regional authorities, namely the Governor of the Cautín Province, have commented on the ongoing strike. The Chilean government of Sebastián Piñera has not yet made public statements about the situation of the 31 Mapuche detainees. Protests are scheduled to take place on August 2, 2010 in Concepción, Valdivia and Santiago.